First up is this hip fox couple. 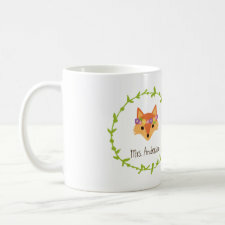 Mrs. Fox is wearing a tea-length dress with flowy sleeves and an up-to-the-minute flower headband (so very Bohemian) and Mr. Fox is sporting a bow tie with his vest. 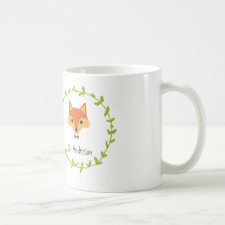 Here’s where you can check out the complete Rustic Boho Forest Foxes Wedding Invitation Suite. And just how can I, crazy cat lady, not do a cat couple too? 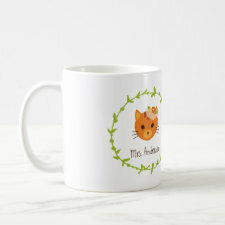 Mrs. Cat is wearing a fascinator with her ecru tea-length dress and Mr. Cat is wearing a bow tie with his suit. (I can ask him to wear a regular necktie instead if you’d like that better.) 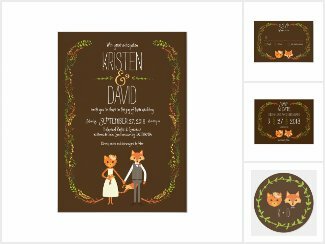 Browse the Rustic Boho Forest Cats Wedding Invitation Suite. Both sets have invites, save the dates, table numbers, postage etc. Text, fonts, and background colors are customisable through Zazzle (gotta love ’em!). Fingerprint trees and matching his and hers mugs are also available. I also got a request for a cat and fox couple so here you go!